Since the fall is my busiest time for ESR (getting prepared for all the shows and fairs I do in the last four months of the year), I've been neglectful of my blog. 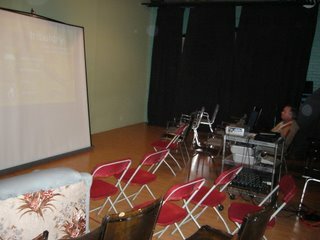 So anyway, here's some reflections and pictures of Screenings 2 and 3 at Centre for the Arts. 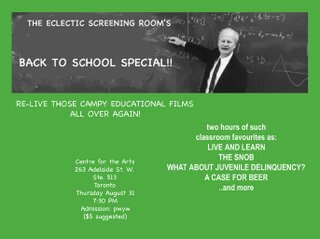 Aug. 30, we had our "Back to School Special" with two programs of educational films. In the first, we showed A Case for Beer, featuring underage teens trying to buy beer; A Case of Spring Fever, in which a man learns the hard way about the virtue of springs; What About Juvenile Delinquency showcases the gimpiest gang of toughs in film history; Ghost Rider features bad special effects in a tale of a ghost teaching Kevin bus safety, and The Snob does homwork on Friday night while people whoop it up at a party next door. After intermission, we unspooled Overs and Outs featuring outtakes from industrial films, the infamous Live and Learn from that humanitarian Sid Davis, featuring kids getting crippled, stabbed and burned while at play; Joy Ride: An Auto Theft documents the consequences of teens taking a stolen car out for a spin; and finally, we ended with Safety: In Danger Out of Doors, with the immortal Guardiana: Safety Woman warning kids about the dangers of loaded handguns and grease fires. Remember, Aware Alert Alive! 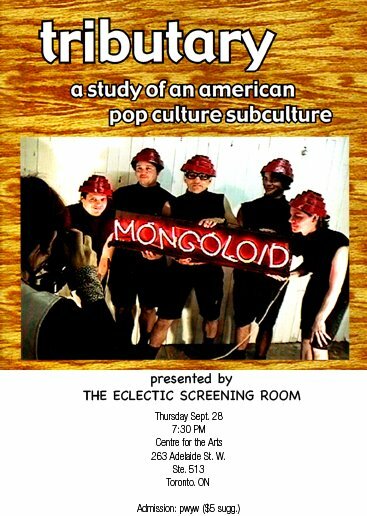 This was a great night, with 25 enthusiastic customers-- even managed to unload some zines and DVD's too. The feeling I had at the end of the Innis screening was repeated here, a sense of pride and accomplishment. I would have loved to have hung around later to celebrate the success of the night, but alas I had to get up at the crack of dawn because our office was moving. And on the last Thursday of September, I showed Russ Forster's entertaining documentary TRIBUTARY, which is a cross-country exploration of people who perform in rock and roll cover bands. I had great expectations for this show, especially with the enthusiasm I was greeted with when I was handing out flyers for the screening at Word on the Street. Well, I won't pull any punches. Attendance for this PLAIN SUCKED. A whopping seven out of a mailng list of 200 people and a few hundred flyer recipients bothered showing up... not to mention any adverts I ran. By far, this is one of the greatest disappointments in ESR's existence... right up there with Hive magazine's embarrassment of a show Pulp & Plastic. It is setbacks like this where fringe dwellers ponder why the hell we do what we do if no one supports us. Well, that's Toronto for you. People will assume someone else will support an event if they do not, and then -voila- the same bunch wonder why things close. We'll be back in October, hopefully others will too. One good thing I can say about the event, a few people hung out afterwards to gab, which is something I encourage at these screenings. 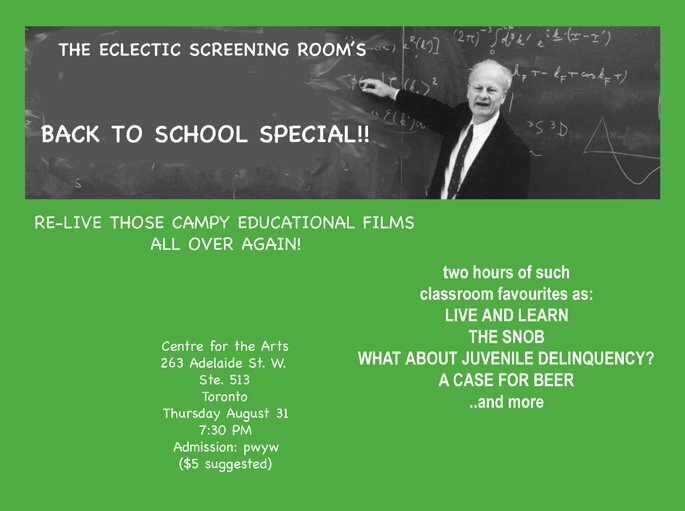 There's no "love em and leave em" rhetoric here... part of the mandate from the beginning was that these screenings, and ESR in general, exist to form a community of like-minded individuals. It should be a social thing as well as a cultural one. And oh yes, here is a photo of the space, to give people an idea of the essence of the event.